Wow, we were so non-traditional celebrating Pioneer Day yesterday. We didn't even watch the parade on TV. Woke up, had breakfast and headed outside to clean the van. 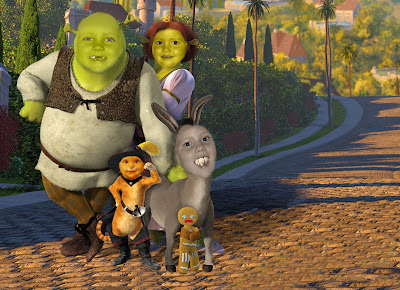 Jordan stars as "Shrek", Madison is "Fiona" Taylor is "Donkey" and Reagan is "Puss in Boots". The kids have a copy of the picture and they're still talking about it this morning. There are just a few things that I would like you four kids to know. Well, there's A LOT I'd like you to know, but here are some of the highlights. #1: I wanted you all TERRIBLY. Because I wanted you so badly, your dad and I couldn't stand the thought of "someone else" raising you. It was so important for me to stay home with each of you - I didn't care if we ate mac and cheese the rest of our days, and could totally be content with never taking a family vacation again. Every little financial struggle has been worth it to wake up each morning and have my "job" be all of you. *I* heard your first words. *I* saw you take your first steps. *I* got to watch your sleepy little eyes and the tired little yawns. All those moments are MINE, and I take them all selfishly. #2: I WANTED you sleeping next to me. #3: I kept you away from bottles. I wanted to breastfeed you. It started out hard with all of you. It would have been more than easy to quit. In fact, in our society, it seems to be a "do what makes you comfortable" vs a "do what's good for your baby" mindset. I knew it was the best thing for each of you, and I reminded myself of that when I sat on the couch sobbing in pain. I knew that it wouldn't last forever (even though at the moment it seemed like it would). I tolerated the ill comments from others who found out that I nursed most of you beyond the age of one. Maybe it was their guilt talking. I questioned myself once about it, but soon got over it and decided I didn't care what anyone else thought - I was responsible for you. I am your mother. I had your best interest at heart the entire time. #4: The messy house doesn't bother me much. A spotless house sounds like heaven - but our "clutter" reminds me that my children live here, they're comfortable with their surroundings, and they really feel like they can be themselves. I was going to paint over the scribbles in the tv room long ago when Madison first put them there. But as I've let them sit, they remind me of a time when she was so little - she's growing so fast and soon those scribbles will be a treasure and reminder of my little girl. Obviously I'm a lazy blogger this summer... to much going on! I feel like I need to post pictures whenever I create a new posting... Brian keeps taking the camera with him though, so I haven't taken ANY of the kids in the past month. Bad mommy. Madison wants her *beautiful* long curly hair cut "like the boys". She's begged and begged. I cut about 2 inches off on Sunday just to make her happy. We keep telling her that "princesses" have long beautiful hair, NOT hair like their brothers. It would be tragic to loose her curls!!! Jordan lost ANOTHER tooth... a molar. The poor kid hardly has any teeth left. I can hardly wait until his permanent teeth come in. I won't recognize him though - he's had teeth missing since he was just under two years old! Taylor has enjoyed swimming this summer. That and riding bikes. He's been a great help around the house while out of school, and a HUGE help with Reagan. She likes him and it's nice to have a "break" for a minute or two here and there.